Designers who work in film and television have a great opportunity to create an alternate, redesigned universe in which things work slightly differently, and the fact that Fringe is set in a gaggle of literally alternate universes, each with telltale differences in their everyday environments, makes this all the more delicious. Perhaps it’s design/science fiction squared. Yep, it’s former Apple designer Louie Mantia’s contribution to Tyler Thompson’s excellent Boarding Pass/Fail exercise, which in turn is part of a recent trend in speculative, non-commissioned redesigns that can be found on the web. I’ll read this charitably as an homage, or a vision of a utopia where Louie Mantia really does design our boarding passes (which I much prefer to the current iTunes icon, which he also designed). 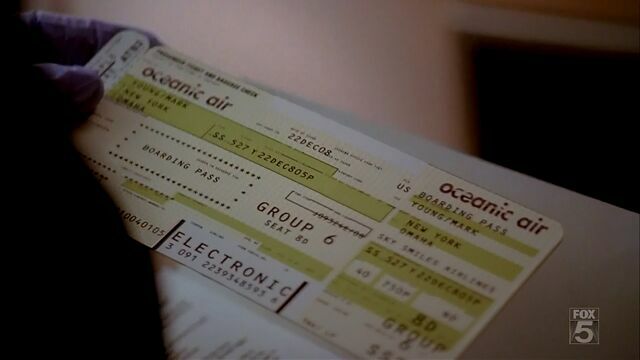 Of course, this isn’t the first time that Fringe has snuck in a boarding pass Easter egg. Back in Season One, Lost’s Oceanic Air made a sneaky appearance. After Flight 815, I think Oceanic are due for a rebrand.